Artificial Intelligence or AI has solidified itself as a primary force to assist humans in different scenarios. It supplies the intelligence necessary to make better decisions in solving issues. Customer service is an area where most companies lack. It sounds easy but it is a problem for many organisations. With the coming of changes in the technological ecosystem, chatbots are have now become a solution. They enable companies to converse in an intelligent manner with customers while reducing operational cost. Chatbots can offer an invaluable customer service experience. They must be used with the right amount of human assistance. We live in a fast-paced world and customers want efficiency, ease, and authenticity from a company. Chatbots are one of the most powerful tools for solving this challenge. Companies are rapidly harnessing powerful AI and ML capabilities which can actually listen to customers and provide relevant replies in return. For a customer to be satisfied, they need faster response for their queries. As the world has gone online, most of the customers seek faster resolution of the questions, which influences their satisfaction levels. Obviously, this satisfaction drives more sales in the long run. Implementing AI technology doesn’t necessarily mean that you fire employees. We still are far away from employing automated bots to do the work, while continuing to search for the right-balance between AI and humans. A high-quality chatbot can be seamlessly integrated into the customer service environment and bring value to the customer experience. However, it is important to select the right fit for your business. With a plethora AI applications available in the market, it is important to evaluate them clearly to understand which one would be the best choice for your business. A chatbot is not a replacement for a human agent but can add value by automating mundane and repetitive tasks. However, to maximise benefits it is important to narrow down the scope to a specific set of tasks and determine when a more specialised service would be required. Define a clear handover process to a human agent. Research has revealed that 69% of consumers prefer chatbots for quick communication with brands. It is clear that speed of response is an important factor for customers so it is vital that any handover from chatbot to humans does not slow the process. Understanding your customers’ identity and how they are most likely to contact you for business should be the basis of an omni channel approach. Digital channels are a key part of the omni channel strategy. However, this does not mean that voice interaction has no value in the communication process. 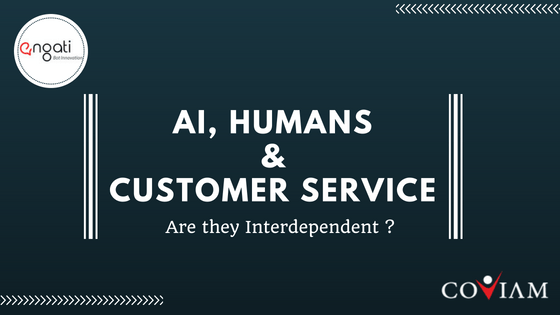 It is unlikely AI will ever completely replace email or phone as effective customer service channels. In fact, there is no question that AI tools with facial expression analysis capabilities will continue to proliferate. This will give the bots more data and make them a lot smarter. Build your own bot for free with Engati. It will hardly take 10 minutes and you don’t need any prior programming knowledge. It is easy to build and maintain. Our in-house experts will help you through it. Create your own bot, schedule a demo for free!